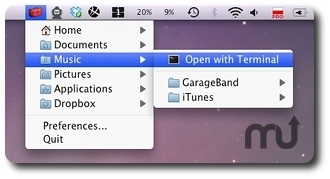 Open files and folders from the menu bar. Is there a better alternative to Menu Browser? Is Menu Browser really the best app in File Management category? Will Menu Browser work good on macOS 10.13.4? Menu Browser is a small utility program which lets you quickly and easily browse your files and folders, without distracting you from your current tasks. It is accessible using a status bar icon and a keyboard shortcut (in fact it can be fully controlled using the keyboard), which makes is always easily available. Customizable actions (using ActionScript) give you a lot of flexibility in defining on how a selected file or folder should be acted upon. Bundled actions include sending a file using Skype or opening a folder in iTerm or Terminal. New file-action: Send file from the selected folder using Skype; requires newest Skype (2.8.0.851). Must be enabled in Preferences->Files. Menu Browser needs a rating. Be the first to rate this app and get the discussion started!